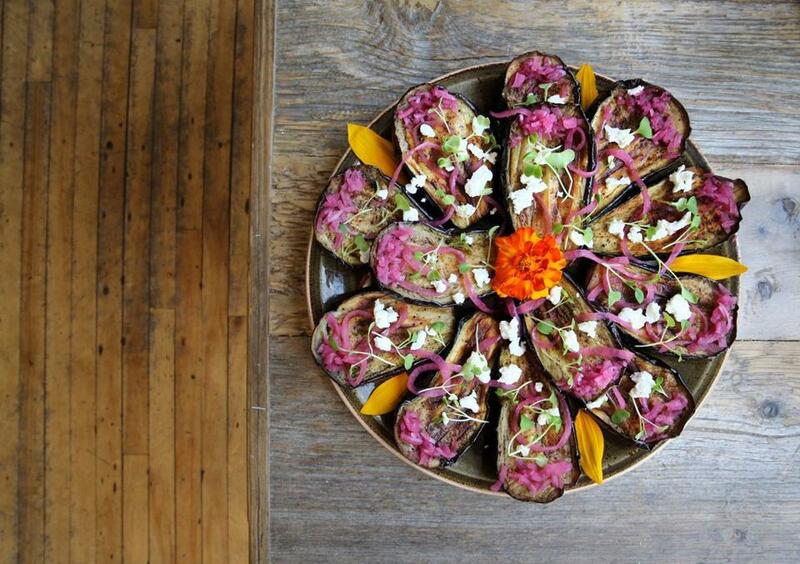 Eggplant with goat cheese and housemade pickled red onion at Saltbox Kitchen. For years I’ve been compiling a list of stylish, owner-operated cafes with artisan menus (all the food made on the premises) in nearby towns I happen to be driving through. They’re spots where I can settle in for a late lunch and even if they’re busy, there’s no rush for my table. The places have to be bright, even on a dreary day. In the lineup: Superfine Food in Manchester-by-the-Sea (with locations in Marblehead and Newburyport), where familiar food is turned out with amped-up flavors; Honeycomb in Hamilton, which is a happy place with an appealing menu; and Rifrullo Cafe in Brookline, a longtime favorite where any sandwich on the house bread is exceptional and you might eat it next to the local beat cop. Add to those Saltbox Kitchen in West Concord, the only one connected to a working farm, where the route from Saltbox Farm to Saltbox Kitchen is about 6 miles. This time of year, most of the prepared dishes in the case — imaginative interpretations of foods you already know — are fashioned from the farm’s produce. Saltbox, which opened three years ago, has a catering arm and now a brewery. The corner spot in West Concord has windows on two sides. Wonderful light! The place is busy, but cooks are replenishing platters throughout lunch so you never feel like you’re getting the dregs. Prepared foods are sold by the pound; or order a sandwich like a Reuben with mustard slaw or deviled eggs from the farm’s flock. At dinner, the menu might offer scallops with braised greens, steak with tomato escabeche, or zucchini pasta with sunflower-seed pesto. That pesto is tossed with fregola, which are tiny semolina balls, sometimes called Sardinian couscous, with a nice chewy texture. Also in the salad is chopped kale, caramelized onions, and tiny cubes of carrot, zucchini, and summer squash. A warm egg sandwich on a soft, sesame bun from neighboring Nashoba Brook Bakery is spread with sun-dried tomato puree; the tender, golden eggs from Saltbox Farm are thick and frittata-like. Roasted cauliflower in a sherry vinaigrette with raisins is flecked with chopped kale, and roasted eggplant is garnished with pickled red onion and an exceptionally creamy goat cheese. The farm needed a lot of attention and Elliott, who was raised in Wayland, and had spent childhood summers cooking with his grandmother and planting with his grandfather, has spent the last seven years “working to fix the farm and bring it back to life.” Now there are bees, hens for their eggs, sheep, and a CSA program. Opening the restaurant was the way that Elliott could bring together agriculture and a culinary experience, he says. Now the farm offers cooking classes and hosts dinners in the field. Elliott’s mother, Jane Elliott, who was raised on the farm, looks after the flowers. There’s a farm manager, a cooking teacher, someone to tend bees, and at the restaurant, a brewer, more managers, and cooks. “There’s an amazing team of people who make this all happen,” says Elliott.